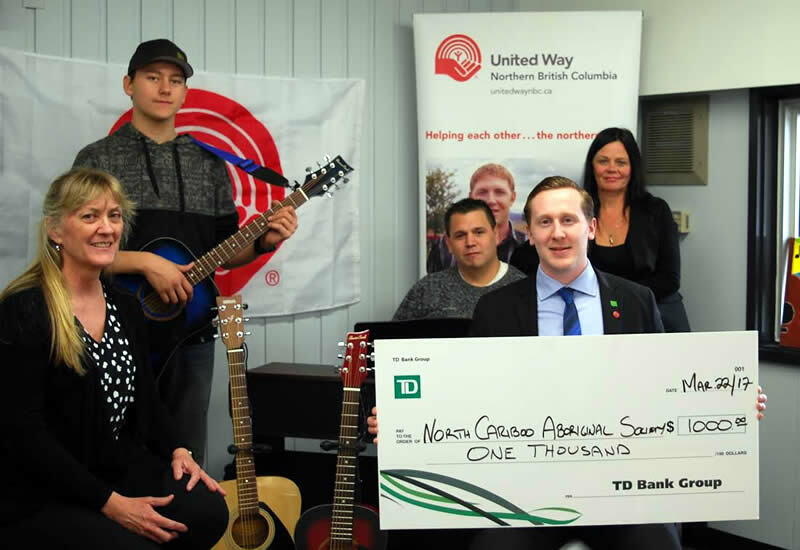 The United Way of Northern BC (UWNBC) will continue to make life better for children and families across the north thanks to a recent contribution. The Ministry of Children and Family Development awarded $250,000 to the group on Monday that will assist Child and Family Early Year Initiatives across the region. How the money is spent comes down to what each community needs. “Stakeholders in those areas that are involved and very knowledgeable about early years and they then assess what their community needs for their area and then they just send in a proposal to us and we grant them that money,” says Roberta Squire, United Way of Northern BC CEO. In response to a high unemployment rate coupled with low literacy, the Upper Skeena Development Centre created the Senden Holistic Youth Program that helps youth gain the confidence and life skills needed to become successful adults. With guidance and support from many local partners, a local advisory composed of elders, traditional knowledge keepers and service providers, and funding from the United Way of Northern BC, Senden programs build skills, knowledge and confidence for youth. United Way distributed Baby Boxes to Baby’s Best Chance Pregnancy Outreach and the North Peace Pregnancy Care Centre in Fort St John today. For over 75 years, Finland’s expectant mothers have been given a box by the government. It’s like a starter kit of clothes, sheets and toys that can even be used as a bed, and it has helped Finland achieve one of the world’s lowest infant mortality rates. One of the most common ways babies die is by accidental suffocation — being smothered by sleeping too close to parents, pillows, soft toys or blankets. The idea behind the boxes is to remove all those objects and promote safe sleep — cheaply — for all moms. “Treehouse Foundation,” Airs on Saturday, May 13 at 10:00 am EST or you can view the episode here. The Treehouse Foundation highlights a community founded to ensure children who have experienced foster care find lifelong family relationships. Treehouse Foundation (Easthampton, MA) is re-envisioning foster care in America through intergenerational programs where children in foster care and the elderly come together to support one another, leading to fulfilling and productive lives. As founder and foster parent Judy Cockerton would attest, they need to know they’re not in the foster care system because they did something wrong. Many times older people age out themselves to live in senior housing where they feel isolated. With still so much to give, they offer valuable teachings to the kids. Together they form a loving community. Diagnosed with autism when she was a toddler, Hannah, 14, refused to go to school or even leave the house. Her mother tried everything to get Hannah to attend school, but the teen became even more isolated and withdrawn. Hannah’s mother began attending the Cooking with North Coast Community Services (NCCS) program in Prince Rupert and invited Hannah to come along. Meeting every Friday night, the group prepares a meal together while the younger children are looked after on the other side of the room. At first, Hannah just wanted to cuddle the babies instead of helping prepare or clean up after the meal. With the urging of Infant Development Consultant, Sarah Browne, Hannah began cleaning up, and eventually came to enjoy helping chop vegetables, cooking and socializing with the group. Through the generous donation of 20 Telus Hockey cup tickets from RBC Bank and their close relationship with United Way Northern BC, a wonderful opportunity has been opened for kids to attend the hockey game tonight. United Way has funded the Y-Citizens After School Program for a number of years. Through the program kids are able to receive quality after school care, leadership and a safe environment before their parents get home from work. United Way of Northern BC has been a consistent funder of the Crisis Prevention, Intervention and Information Centre for Northern BC because of the amazing work they do in helping our most vulnerable populations. With this in mind, we were extremely excited to have Sandra Boulianne and her team in Terrace for three days last week to provide G.R.A.S.P – Getting Real About Suicide Prevention training to our Terrace youth. They collaborate with and support agencies, front line workers, social workers, first responders, education providers, industry and the general public to develop an approach to suicide prevention. Sandra and her team will also be in Kitimat this May 26th to 28th to provide the same training to teens in the community. TD Bank is music to our ears…. 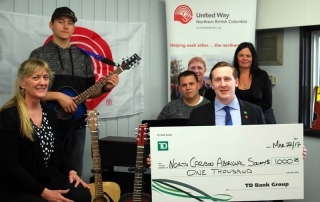 Quesnel, BC – The TD Bank, through the United Way, has provided $1,000 to assist The North Cariboo Aboriginal Program Society to fund a music program targeted at youth in Quesnel. The money will be used to purchase musical instruments for the society’s Youth After-School Leadership Program located at Baker Elementary School, 610 Wade Avenue. Thanks to you, a United Way youth-counselling program became the difference between life and death for Parker McDowell, who once struggled with mental health. Parker McDowell struggled with depression and suicidal feelings throughout his teens. For him, it was a revolving door of psychiatrists, medication and trouble with the law. But, because of gifts like yours, Parker accessed a drop-in counselling program for youth—just one of United Way’s many mental-health initiatives that provide crucial support to people, right when they need it—no waitlists, no appointments, and no fees required. Now, having finished high school and working, Parker’s on the path to a better tomorrow: “My thoughts are happy and I’m excited for the future,” he says. Thanks to your gift, Fardowsa connected with a United Way early-years program—one that has encouraged a love of learning and confidence in her daughters. 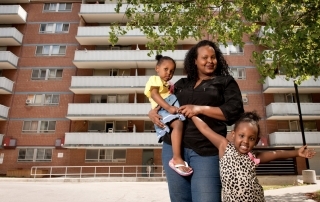 Like every parent, Fardowsa Weheliye wants to provide the very best for her children. 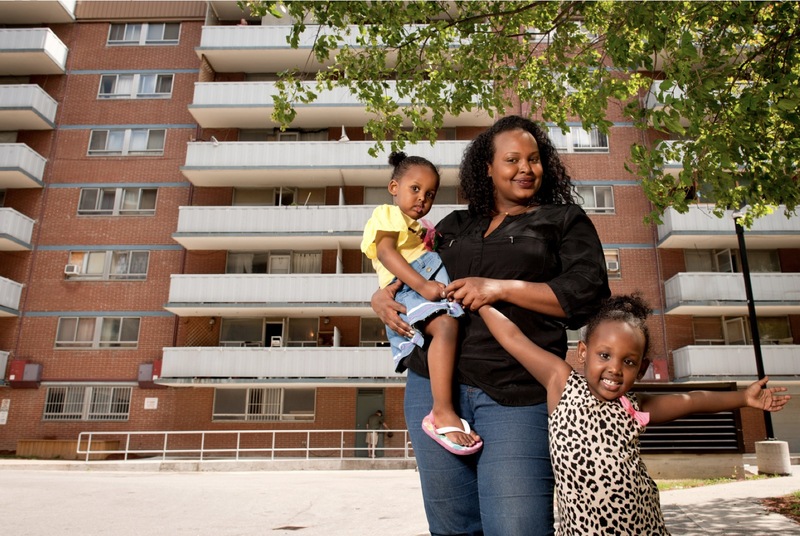 But, as a single, unemployed mother of two, she struggled to give her young girls the best start in life. “They were shy,” she recalls. “Interacting and sharing with other kids was tough.” Things were hard on her, too—Fardowsa was feeling increasingly isolated. But, thanks to your generous support, Fardowsa was able to connect with a United Way program that provides young children with literacy training, arts and crafts, and music and dance activities—the vital building blocks they need to become prepared for school. The best part? It’s a welcoming space where kids and parents can forge new friendships.